Publicity writing can be a challenge when you are trying to write several press releases for the same client without repeating the same phrases that we all tend to use in our writing styles. So what is the answer to this writing pattern? 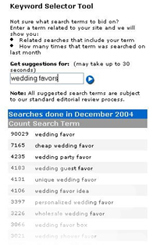 Try using a keyword search tool. The Internet has opened up a vast amount of tools for all of the publicity and advertising industries. The problem is not everyone sees or really understands how to apply these great tools to their everyday business activities. For example, I just mentioned that publicity writers should use keyword search tools to make their press releases, articles more targeted to the pr client’s market. PR Clients want to know that when a press release is submitted, it gets published and noticed. One way to help this process along, is by inserting the different phrases and keywords that you might not have considered. Why use these keywords and phrases? For a lot of reasons! One of the most important reasons– your release on the internet will get higher rankings and help your PR Clients web site rank higher as well. Reporters, when searching for specific topics, will find your release easier and faster because of the keywords you inserted. There are a lot of keyword tools, such as Overture, Wordtracker among many others. Visit one of these keyword search tools, try it and I can assure you that words and phrases will appear that you probably didn’t think about before. One more important point. The number next to these keywords are the number of people who typed that word or phrase into a search engine. That makes these tools more valuable when writing. Good publicity writers think the only way to get an email read is to give the facts. A copywriter believes it is how creative you are that gets people to read an email. So who is right? Both. You need to put on the creative thinking cap when writing powerful emails that can generate a publicity story, or get an article published. So what are the tricks to getting emails read? No silver bullet when it comes to the media. Just keep the creative in check. Don’t lie or twist (pr people like a publicity twist when possible) the truth. Give your recipient a reason to open the email, then provide them with the information you said you would. Otherwise, your name, company, can be put into the "do not read" list. There is a top 10 list of ways to make your emails read, and this can apply to B2B, consumers and even the media. Just keep your mind open to the audience your are addressing to. A good report titled “Ten E-mail starters to break writers block” will give you some good sampling of what I am telling you to do. Publicity people and pr clients need to read these top 10 and see how to make the rules apply to your specific situation. The writer is giving you some tools, now you need to adapt them to your publicity campaign. If you are developing an email campaign, then all you need to do is follow the steps.